For the days when you just need coffee in an IV. Lorelai Victoria Gilmore is a whirlwind if there ever was one. Maybe it’s the immense amount of coffee she consumes, but her ability to meet every challenge while keeping a calm exterior and bank of one-liners on deck is unparalleled. I for one would love to charm everyone I meet by referencing one of a thousand books that I know like the back of my hand, while also dressed in an eccentric outfit that somehow only I could pull off. Wouldn’t you? Lorelai loves wrap dresses; she wears them throughout every season of the show, and on top of that she loves fun prints and colors, so the three dresses pictured above are perfect for her! A classic black blazer is a staple in every working woman’s closet as it doesn’t necessarily need to be paired with a plain black skirt or pants like a suit — it can be worn over almost anything to transform an outfit to be a little more formal. T-shirts are an absolute necessity in any Gilmore’s closet and of course, self-promotion is never frowned upon, so why wouldn’t Lorelai have one from her own inn? The Bangles are Lorelai’s favorite band, and so the Manic Monday one is a nod to that, possibly purchased at the concert she went to. Blouses, whether over a skirt or jeans, are also something that we see Lorelai wear quite often — both to work and on casual shopping trips. Boot cut jeans also appear to be her favorites – and can you blame her, they’re so comfy and classic! Last but not least, this girl loves shoes; white sneakers are a classic, but these rainbow hued ones are a perfect match for Lorelai’s fun-loving personality, and love for anything that sparkles. Last but not least, the black boots are just something to wear with everything! Even when she oversleeps, Lorelai always manages to look fantastic — not necessarily appropriate on her first trip to Chilton — but pretty great nonetheless. 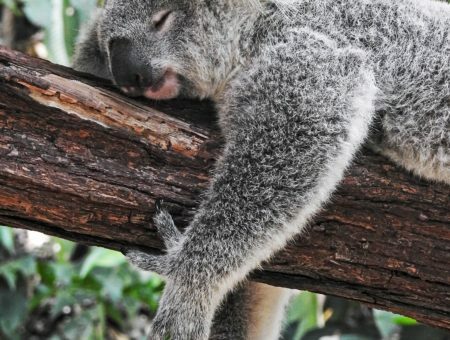 But you needn’t have overslept to wear this cute outfit to class! 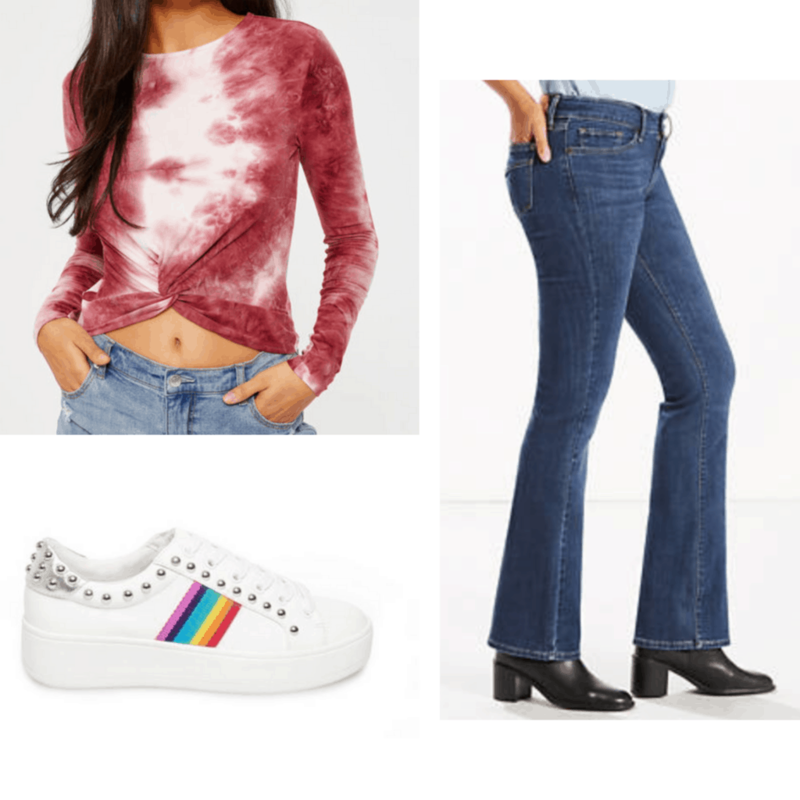 A little reminiscent of the early eighties with the tie-dye print and boot cut jeans, the outfit is still fitted enough to flatter. The colors are muted enough to not be too much for class, yet somehow the whole ensemble has so much personality that it speaks for itself. Though always well dressed, Lorelai is also extremely pragmatic. She doesn’t beat around the bush and generally keeps comfort and ease at the forefront of her decisions. 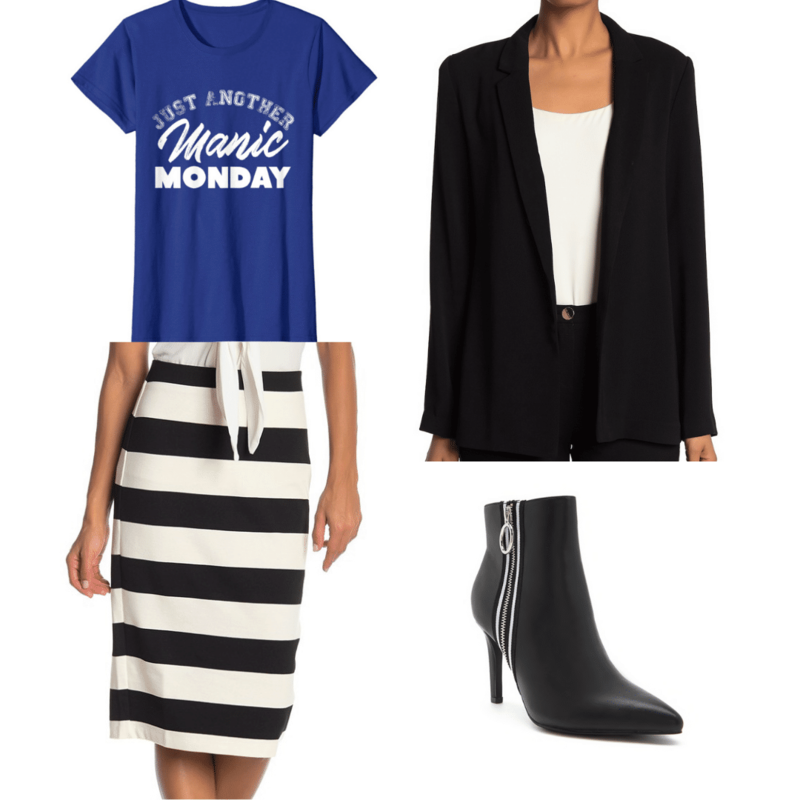 This outfit is something she would wear if she had planned a long day of running errands or driving around but still had to pop into work for a little while. It’s not too casual for running an inn, but not too formal to be running from Stars Hollow Books to Luke’s to a parent-teacher conference — in fact, it’s perfect for all of the above! That being said, she is also not one to let the weather get her down, so this is also a great pick for a rainy day; keep cheery and use your clothes to do it in this bright yellow blouse. We all have those days when we totally forget to save an outfit for laundry day, and still want to look put together enough for work or class. This is a classic ‘throw a blazer on to class it up’ situation where even a band t-shirt can look good enough for an important-ish day. This is definitely something Lorelai would do; possibly with little or no time to change before Friday night dinner, or maybe Emily needed her help again and she didn’t have time to go home and grab another outfit. The shoes and blazer make this look formal enough for a quick meeting with a professor, but take the blazer off and it’s a totally casual outfit for lunch with a friend! This is a typical “Lorelai at work” outfit — she is always well coordinated and is always quite well dressed for daily activities at the inn. Boots and skirts or dresses are a favorite pairing for her, and as always, a blazer over any outfit makes it a little more formal in case of a meeting at the bank or with her insurance agent. I would personally wear this if I had a presentation in class or a meeting with a professor or advisor. This combination might also just be acceptable enough for a slightly more informal networking style event! What do you think of Lorelai’s style? Personally, I think Lorelai Gilmore is a formidable woman who embraced life when it most certainly did not go her way. She single-handedly raised an amazing daughter, and successfully ran her own business, all the while living a life filled with amazing experiences and great friends. With quick wit and killer blue eyes, she is never at a loss for words and carries herself with amazing grace; I think we could all take a page from her book, both life- and style-wise. 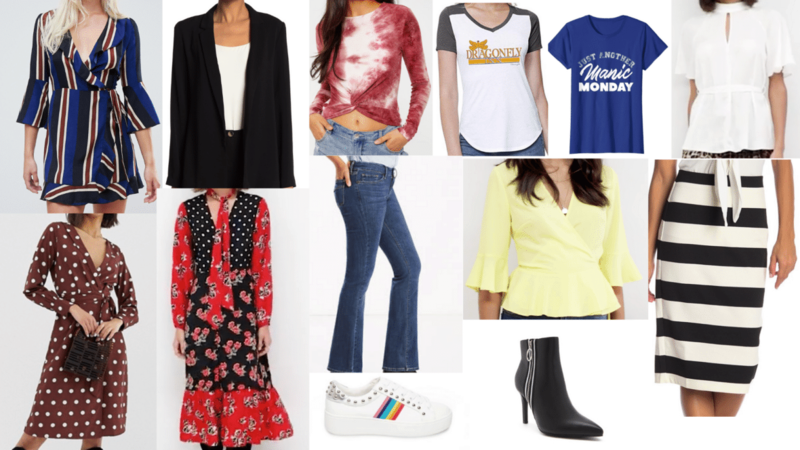 Did you channel your inner Lorelai and wear a quirky outfit? 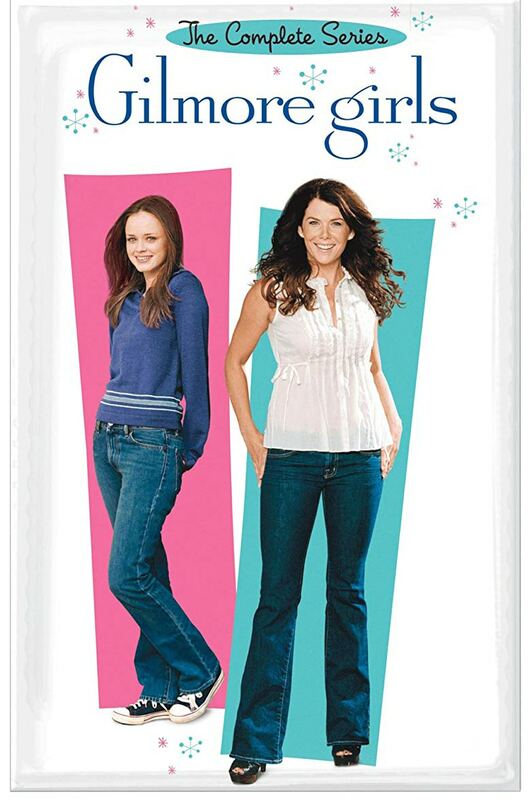 Do you have a favorite Lorelai or Gilmore Girls moment? I want to hear about it — let me know in the comments!